The great West window and is the view most travellers see when alighting from the bus on the Broadway. The wall just out of shot at the bottom of the photo also forms the Western extremity of the boundary of the ancient holy site and was where a number of boundary stones, thought to belong to the neolithic period, were discovered during excavations in late 1999. The image also shows well the central raised roofline added during the Victorian re-ordering of 1856 – 59 that changed the rather squat external appearance of the mediaeval building to the grander, loftier building we have today.Most of the tracerey in the West window was replaced in the 1980’s but follows the original 14th Century stonework. The tower was added around 1839, replacing an earlier spire, the change in the stonework can just be seen around the level of the top of the clock – the addition of some 1200 tons of stonework to the early 14th century internal pillar, as well as the extra weight of the raised roof caused problems to the C14th pillar supports that the guide will be pleased to point out. Just under the right side of the West window, there can be seen the remains of one of a number of earlier grave covers from the building that pre-dated the current church. The stone shown is the best preserved, the tour guide will be pleased to point out more if asked. The South door of the church, and the associated porch is Victorian – the machine cut stone being much sharper & cleaner lined than the Southern wall made from mediaeval hand cut masonary. The outline of an earlier porch can just be made out to the west (left) of the current porch roof-line. Prior to the 1859 re-ordering, there was a corresponding North door, the Saxon floor plan discovered in the 2009 excavations also showed a North door, although all traces of the mediaeval door have now vanished. The windows in the nave are Victorian, replacing the original windows shown in the drawing below dated 1784. The windows in the transcepts are of both lancet & trefoil design and are thought to date from the 14th century build. The glass in all windows is mainly Victorian, although the Great West window is from the 1980’s. St Michael’s is a living building, and has developed to meet the needs of the town it serves over the centuries. We know from the records that galleries were installed internally to meet the growing population in the 1700’s, but were removed when the rise of Methodism meant they no longer served their original purpose. The image below shows a date of 1606 on the wall of the South transcept a good 5 metres above ground level and too high, and of too good a quality to be graffiti. It is assumed this date is associated with some earlier, external work that we are currently unaware of, but after some 250 years of wear & tear the building must have needed some extensive maintenance. The image above shows the East end of the building and the Great East window. Also of interest is the stonework above the 2 lancet windows showing the top of an earlier, wider window, shown in the illustration below dated 1815. The stringline in the stonework can be used to accurately gauge both the position & size of the original window. 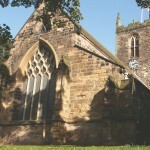 The chancel was lengthened by approximately the length on this window sometime after 1350, as can just be made out on the photograph below; the chancel stonework to the West (right) of the drainpipe running down from the guttering is Norman and contains the oldest window in the building. The additional building work may have been because the original wall was unstable; but the new Eastern wall was supported by single diagonal buttresses as opposed to the twin, inline buttresses elsewhere on the C14th building pointing to a later construction date. The 2 lean-to buildings are Victorian built to house an organ and their construction destroyed some of the earliest above-ground parts of the church, as well as the light and symetry of the chancel. The change in stone work from the earlier low tower to the later, current tower can be plainly seen here. The Great East window, as far as we know follows the original design, although some of the stone tracery has been renewed. The 2 small buttresses below the window suggest there may have been 3 narrower lights rather than the single large window, but all historic drawings show the single window – we shall never know if the original layout was different.